IT was my birthday this week, and I didn’t get one birthday card. I did, however, receive four texts, three emails and 33 messages of varying degrees of sincerity on Facebook, as well as a handful of festive tweets. My phone was pinging all day with little digital messages from my friends who I never see in real life and family members I’d forgotten I even had – and you know what? It made me feel all warm inside. Because I am a phone zombie. 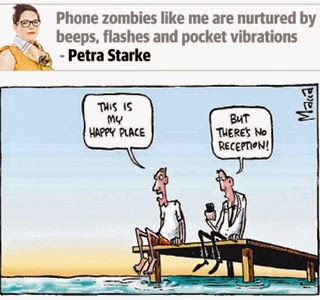 Phone zombies don’t feed on brains, they are nurtured by beeps and flashes and pocket vibrations. We’ll be the only ones left standing when the apocalypse comes, not that we’ll know about that – we’ll be too busy staring at our smartphones. You think I’m exaggerating, but the early warning signs are already there. Yesterday a story out of San Francisco detailed how passengers on a crowded commuter train had failed to notice a bloke waving a gun around, and subsequently shooting someone, because they were all too absorbed in their phones and tablets. Of course, that’s America, the only country in the world where guns could possibly outnumber mobile phones in the first place. Still, if you’ve ever watched a phone zombie in action it’s not hard to imagine how such a thing could happen. I’m somewhat embarrassed to admit I spend a lot of time engrossed in both my phone and iPad, and feel completely lost without them. If I accidentally leave my mobile home (which very rarely happens, as it is barely ever out of my hands) I find myself reaching for it every few minutes to check my messages, only to feel a pang of sadness when I remember that it is not there. I’m the first to admit this is a) pathetic and that b) I have an over-reliance on social media and technology – which is why my entire family reacted with shock at my birthday lunch when I announced that I was going to cut back on my smartphone use. We were trying to come up with a list of B-side songs that had proven to be more popular than the original singles (for the record – Madonna’s Into the Groove, Rod Stewart’s Maggie May and Bill Haley’s Rock Around the Clock are all game winning examples). Before the smartphones and 4G internet connections came along and killed it dead, this is what was known as “having a conversation”. “I can’t believe you haven't Googled it yet,” my sister said, 30 seconds in. “I’m trying not to do that anymore,” I replied, my fingers itching to pick up my phone and find the “25 B-sides that sold more than the A-sides” Wikipedia page. I’ve already stopped reaching for the phone in the car, having been shamed into submission by the Sunday Mail’s recent anti text-and-drive campaign – not to mention a hefty fine when I was caught. We all know it’s irresponsible and dangerous to use our phones while driving – studies have shown it’s almost the equivalent of driving drunk or on drugs – and yet so many of us are such phone zombies we can’t seem to stop. Car manufacturers know this, which is why they are designing vehicles that can interact with your mobile, allowing you to compose and send text messages, cue music and update your Facebook status while you tootle down the highway. There are at least three current car commercials advertising these features – all aimed at a youth market. Sure, it's all done hands free and therefore legally, but isn’t that missing the point? When the crystal clear message is “do not use your phone while driving”, shouldn’t we be trying to stamp out the distraction altogether, rather than find ways to make it legal? The last thing we need are phone zombies on the roads. First published in The Advertiser, October 10, 2013.